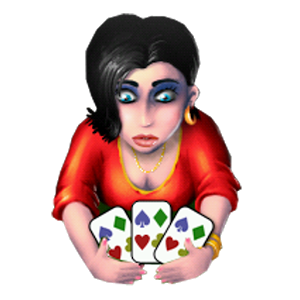 Mau Mau is a classic card game on your mobile phone screen for two to four players. The game is played against three computer opponents, so that a total of four players can participate in the game. The player may choose in the menu a different number of players (two to four) and select which players should be present. The player's cards are located at the bottom of the screen. The game is turn-based, each time a player moves, (s)he either plays card from hands or takes a card from the base pile. The goal of the game is to get rid of all the cards from the hand. Those three guys don't cheat. They get same random cards as you, and don't see at each other's cards or under the pile. They use their own logic to play, same like you can.